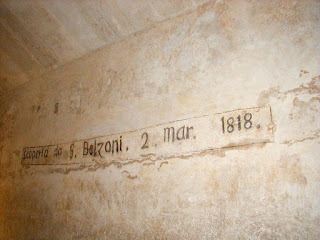 On this day two centuries ago, and with the express permission of the Pasha of Egypt, adventurer and pioneering archaeologist Giovanni Battista Belzoni became the first person since Antiquity to penetrate and explore the Pyramid of Chephren, the second largest structure of the complex at Giza—though looters from nearly a millennium before had already partially plundered the burial chambers. How the Great Belzoni, as he styled himself, came to be there is a pretty intriguing tale in itself—born one of thirteen siblings to a father who was a barber in Padua—he went to Rome as an apprentice plumber with the intent on taking monastic orders but his career path was suddenly diverted by the occupation of the city by the forces of the Napoleonic armies and abduction of the Pope. After a stint as a barber in the Netherlands, Belzoni moved to London and found his wife and joined a travelling circus (as you do), incorporating magic lanterns into his acts. After nearly a decade of performing with the circus, they allowed him on the international circuit, touring with shows on the Iberian peninsula and Malta—where he happened to meet an emissary of Ottoman Egypt. Informing Belzoni of the pasha’s public works scheme which included large-scale irrigation and land-reclamation, the sideshow actor offered his expertise in in hydraulics and presented the ambassador with a proposal. Ultimately, Belzoni’s damming project was not undertaken but it was enough to get him to Cairo and a relationship with the governor of the county. After a demonstration of engineering prowess and appreciation for the conservation of artefacts with the successful removal (again with the pasha’s permission), transportation and installation of a monumental bust of Rameses II (at the British Museum) and his exploration was partially underwritten by the British consulate. Belzoni embarked on several excavations, making several discoveries. Contracting dysentery, he died en route to explore a dig underway in Timbuktu.